Nika Feyrouz has been dancing and performing all of her life. She started off in the more traditional styles, tap, ballet, modern and jazz from 3 years old on. She has had many years of formal musical training too, from the age of eight. In the Marine Corps Nika was a professional musician on the Flute and piccolo. Around 1993 Nika became interested in the SCA (Society for Creative Anachronisms) where she learned many court dances from the Middle Ages. Soon she was performing with the members of the SCA in Okinawa Japan. In about 1994 Nika became interested in Belly Dance through the Middle Ages and the history of the dance. From that moment on she fell in love with Belly Dance. Upon moving back to the US Nika would dance with friends for the sheer joy of belly dancing. Through a friend, Nika was introduced to Aziza Said. After a few classes she was asked to perform and hasn't stopped since. Nika creates most of her costumes. She owned a jewelry business for about 6 years while located in Japan. learning to sew Medieval gear from a professional seamstress helped Nika in designing and creating her costumes. In the future Nika hopes to expand her horizons through all of the aspects of Middle Eastern Dance. Her newest love is Ethnic Dances and Bollywood! Come join our many classes! 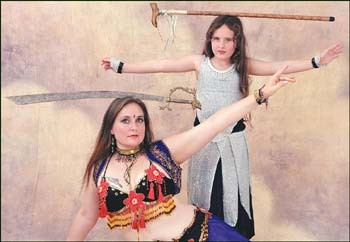 Nika teaches ATS Fusion (American Tribal Belly Dance), Egyptian, Lebanese, Club Cabaret, Ethnic, and fusion Belly Dance. You will get a workout from one of the best Belly Dancers in the Inland Empire. You will learn choreographies, core movement, cabaret and tribal improv, and props including sword, zils, basket, tray, veil, double veil, candles, canes, fans and more! Nika Teaches Classes In Southern California. San Jacinto, Hemet, Lake Arrowhead, Idyllwild, Covina, Pomona, Upland, and numerous private classes. Great for men, children, pregnant women, handi-capable, and seniors. You can also hire Nika Feyrouz or any of her dancers for Parties, Weddings, Restaurant gigs, Bellygrams and more.